Facing a down economy and growing health concerns, the U.S. government continues to increase federal and state tax rates on cigarettes. But are smokers addicted enough to forgo the higher price tags? Cigarette consumption in the U.S. is on a decline. 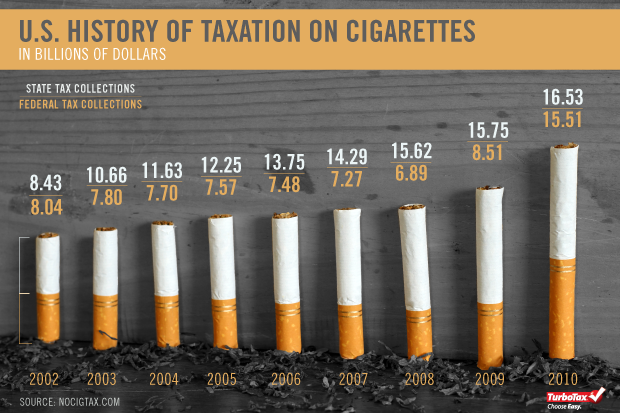 The U.S. generates over $32 billion in cigarette tax collections annually. 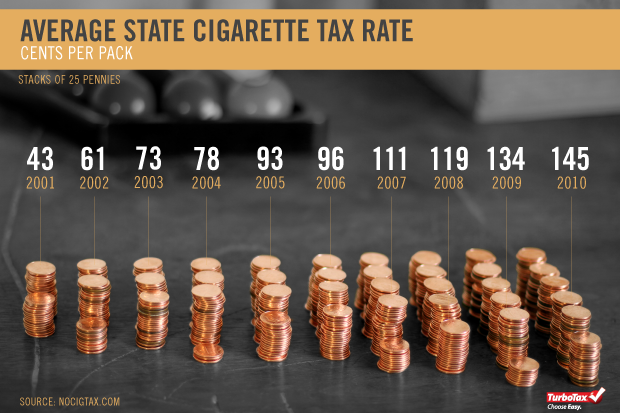 Since 2001 the average state cigarette tax rate has jumped from 43 cents per pack to 145 cents per pack. 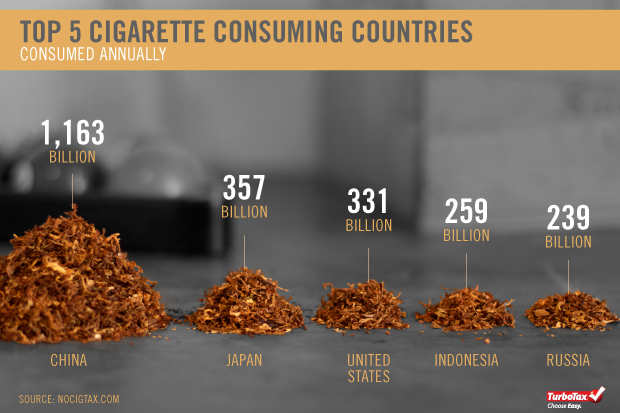 China consumes more cigarettes than Japan, U.S. and Indonesia combined. 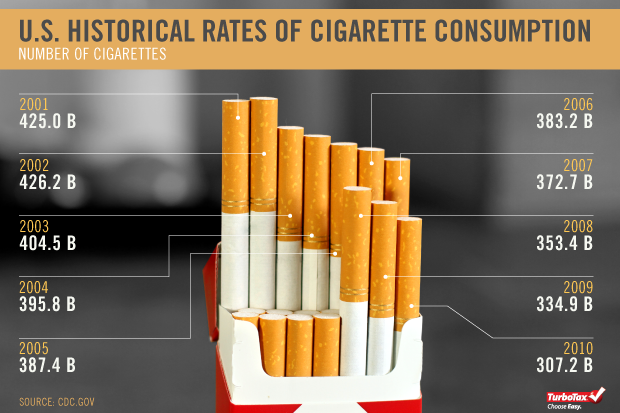 The CDC did a study a few years ago and determined that to cover the cost of illness caused by tobacco consumption, the tax on a pack of cigarettes would have to be $8.00. It’s probably more today. Tobacco should be taxed at 50% because we (the tax payer) foot the bill for Medical and Medicare programs that treat the illnesses these products bring for the elderly and uninsured. Alcohol should also be taxed at 50%. It is time to get tough. 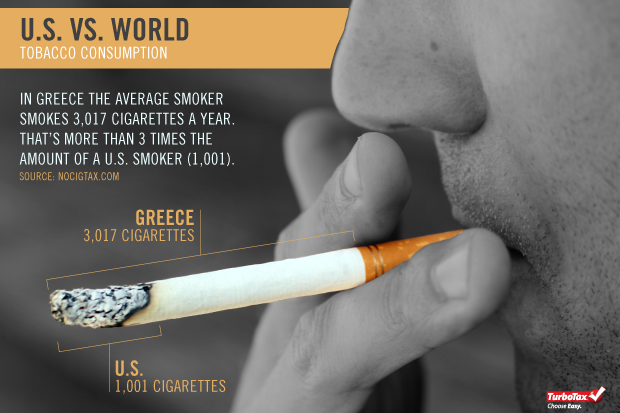 Photo #5: the photo talks about “average smoker”, but it looks like they are commenting on “per capita”. From Tax Burden on Tobacco, in 2008 the average US adult smoker smoked about 400 packs per year, or about 8,000 cigarettes, compared to the photo which gives 1001 cigarettes. I cannot check on the links given for the data (my system blocks this). Cigarettes will continue to rise no matter how high they tax it. For a city like New York, they thrive from the taxation on cigarettes. They even tried banning ecigs because they felt that it would threaten the amount of money they make from the taxable cigarette. It seems people are still going to smoke no matter how high the price goes. There seems to be a lot of legislation plus higher tobacco taxes in recent years but in many regions the sales really haven’t decreased much at all. Would love to seem numbers on how much the average smoker spends a year on cigarettes plus how much that has increased over the years due to taxes and inflation.